Amanda was brought up on a dairy farm in Sussex where she spent her entire childhood immersed in rural life and the thrills of the horse world. She moved to London in her early 20’s where she worked for the TATLER magazine for a number of years before starting her own interior design business. In her mid thirties she returned to the country with her family where she decided to realise her lifelong ambitions to break into the art world. When in 2004, the fox hunting ban was met with widespread consternation from the rural community, Amanda aimed her art as a persuasive medium to preserve the tradition and to show the colour and excitement of the sport. A contemporary figurative painter with a hint of impressionism, Amanda has achieved success in bringing a subject, previously considered dated and obsolete, back into the 21st century. After a visit to Jordan, Amanda discovered a new love and has recently started to look into the traditions and cultures that surround the camel. 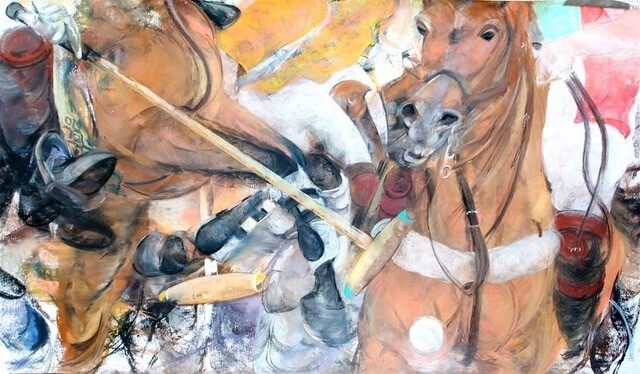 With her unique ability to capture the passion and adrenaline of a figure or an activity, using vigorously broad and sweeping brush strokes and clever use of the palette knife, Amanda is fast becoming renowned for both her equine paintings and the more recent themes she has been developing.